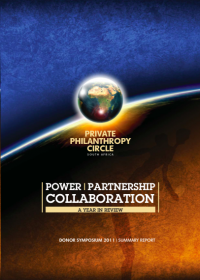 This report presents the critical donor discussions and presentations held at the 2011 Donor Symposium – the first donor symposium to be held by the Private Philanthropy Circle. This summary report provides insight into current themes, trends and debates amongst donors as well as exploring some of the challenges experienced by grantseekers. The symposium examined issues of power in philanthropic relationships, why it is imperative to our democracy that philanthropy grows in South Africa, suggested principles of ethical giving and the usefulness of a forum like the PPC to discuss donor issues in the sector. It also explored experiences of collaboration in the sector. The inputs, discussions and commentary in this report will assist anyone engaging with donor funding from the perspective of both grantmakers and grantseekers, providing interesting insights for anyone wanting to get to grips with the philanthropy space in South Africa.